A large, irregular dispersed area of enclosed land in modern Pembrokeshire, deeply cut into by the boggy land of the Gors Fawr - Waun Cleddau character area that occupies the southern flank of Mynydd Preseli. It lay within the medieval Cantref Cemaes. Caermeini, in the north of the area, has been identified as one of the possible sites of the Battle of Mynydd Carn which, in 1081, secured the throne of Dyfed for Rhys ap Tewdwr of the royal house of Deheubarth - though only for 20 years. Cemaes was brought under Anglo-Norman control by the Fitzmartins in c.1100, who retained it, as the Barony of Cemaes, until 1326 when they were succeeded by the Audleys. Like most of the southeastern part of the Barony within Mynydd Preseli, the area continued to be held under Welsh systems of tenure. In 1118 William Fitzmartin granted the whole area, as part of the grange of Nigra Grangia, to the Tironians of St Dogmaels Abbey. The grange was of considerable extent, comprising 5 carucates which were worth £8 15s 6d in 1535. However, its assessment at only half a knight's fee suggests that much of it was probably unenclosed moorland pasture during the medieval period. The sites of four mills recorded in 1535 are unknown, but Felin Dyrch may have early origins. At the Dissolution, the grange was acquired by John Bradshaw of Presteigne, along with St Dogmaels Abbey, and was thereafter held distinct from the Barony of Cemaes. The Court of Augmentations records that the lands of the former grange were, in 1538-9, held by copyhold ie. the tenant's names were entered into a rental book, within which properties can be identified as the current farmsteads Pantyrhug and Plasdwbwl, and Cwm Cerwyn and Pentre Ithel which were gentry-houses of some status. Their entry and description as 'tenements' suggests that some formal enclosure of the grange had already taken place, and the present pattern of boundaries within the area is typical of early post-medieval enclosure. However, a cluster of 'lleini' farm-names, towards the northwest of the area, indicate a strip field or open field system probably dating from the medieval period. The enclosure pattern in the eastern half of this character area is similar, and probably also late-medieval to 16th century in origin. Blaen-banon, at the far northern end of the area, was recorded as the limit of the formal common of Mynydd Preseli in a survey of 1594. Seventeenth-century farmsteads include Dolaumaen to the northeast of the area (which was the centre of a small estate established by 1786 and comprising 655 acres by 1840), Glynsaithmaen, and Dyffryn Ffilbro. 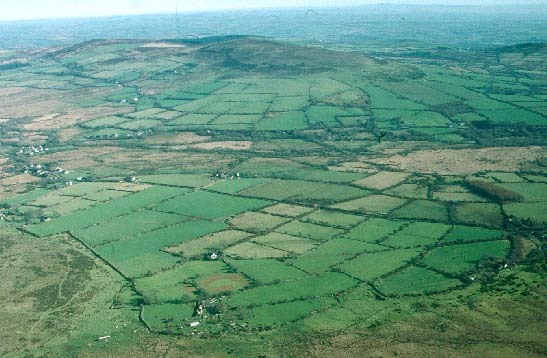 The present pattern of dispersed settlement relates to this and later enclosure of former moorland, some of which, towards the north of the area, may be very late. Charles Hassall's record, in 1794, of the 'extensive waste' persisting in Mynachlog-ddu is reproduced in the County History, and two small pockets of enclosure in this section appear to be to attributable to 18th- and 19th-century squatting. The present enclosure pattern was complete by the time of the tithe surveys of the 1840s. Lower Tyrch slate quarry in the centre of the area - from which County Hall, Carmarthen was roofed - was operational from the late 18th-century until 1939, and housing for the slate-workers probably contributed to the development of the nucleation at Mynachlog-ddu in the 19th- and 20th-century. It was the home of one of the leading Rebecca Rioters of the 1840s and has a chapel from 1794. The later history of the area nevertheless continues to be overwhelmingly pastoral. This area consists of several lobe-shaped blocks of enclosed land lying on the southern flanks of Mynydd Preseli and the slopes of Foel Dyrch, separated by areas of lower lying marsh and unenclosed grazing. It lies between 190m and 300m. Land-use predominantly comprises improved pasture, with a little arable land, though there are patches of rushy-ground and marsh in low-lying hollows, and unimproved and rough grazing at higher levels on the fringes of Mynydd Preseli and Foel Dyrch. Farmland is divided into relatively small, irregular fields, though long, thin enclosures close to Carnmeini farms suggest the former presence of a strip field system not mentioned in the 16th century rental. Mixed stone and earth banks are the most common form of field boundary, but stone-faced banks, earth banks and, at higher levels on the fringes of Mynydd Preseli, semi-derelict dry-stone walls are also present. At lower levels hedges top the banks. Generally these hedges are not in good condition except those alongside roads and lanes; many have gaps and others are becoming overgrown. Across most of the area hedges now either consist of straggling lines of bushes or have entirely gone, particularly at higher levels. Wire fences provide stock-proof boundaries. Apart from a 20th century coniferous plantation close to Llwyn-drain farm, there is little woodland in this landscape, though small trees have grown out of some of the neglected hedges, and most farms have had trees planted around them for shelter. Clumps of trees surrounding abandoned farms on high slopes are a feature of this landscape. Public roads consist of winding lanes flanked by high banks and hedges. The settlement pattern is one of dispersed agricultural holdings with a loose clustering of buildings at the village of Mynachlog-ddu. Two chapels - Capel Bach and Capel Bethel, the latter established in 1794 - and school are present. As noted above, deserted farms and cottages are a feature of the landscape, particularly on the more open higher slopes. Older, extant dwellings are almost entirely 19th century in the vernacular style, and are generally stone-built with slate roofs, one, one-and-a-half or two storey, and 3-bays, cement rendered and bare stone. Most are modernised. It is likely that the cement rendering on some dwellings masks earth-built structures. Several single-storey mid 20th-century timber-framed corrugated-iron clad houses are also present. Later 20th-century development is limited and mostly concentrated in Mynachlog-ddu village. It consists of two storey houses and bungalows in a variety of styles and materials. Agricultural buildings are small, reflecting the size of holding. Most common styles are: a single small, stone-built 19th century range; a mid 20th-century corrugated-iron barn and other structures; and several small late 20th-century steel-, concrete- and asbestos-built structures. There are no listed buildings in the area. Recorded archaeology is diverse with a high percentage of prehistoric sites. The northern, higher region contains a scheduled, neolithic chambered tomb and another megalithic structure, and from the bronze age, four definite and two possible standing stones, one definite and one possible stone pair and a possible round barrow. It also contains one possible site of the 11th century battle of Mynydd Carn. There is also one definite and one possible medieval pilgrimage chapel site, and two holy well sites. Felin Dyrch mill may have medieval origins. Post-medieval sites comprise quarrying features and a sheepfold. Mynachlog-ddu, despite its dispersed nature, is a very coherent historic landscape character area. It is divided, separated and bounded to the south and west by lower-lying parcels of marsh and moor of the Gors Fawr - Waun Cleddau character area. To the north there is a very clear boundary between this area and the open land of Mynydd Preseli. Open moorland and semi open moorland of Foel Dyrch and Crugiau Dwy character areas also provide a clear boundary to the east. 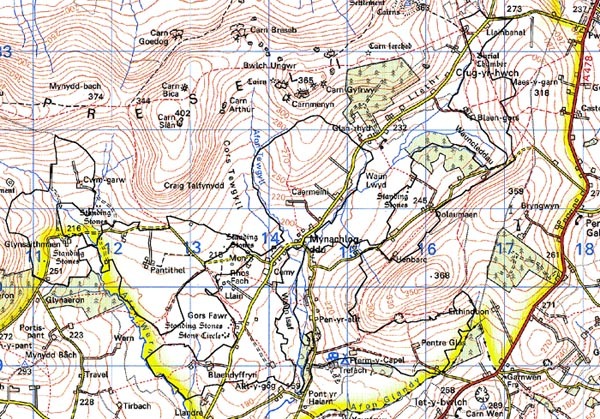 Only to the southwest where Mynachlog-ddu character area meets Llangolman is there a lack of boundary definition. Here there is a zone of change rather than a hard-edged boundary. Sources: Charles 1992; Dyfed Archaeological Trust 1997; Howells 1987; Jones 1996; Lewis 1969; Llangolman tithe map and apportionment 1841; Monachlogddu tithe map and apportionment 1846; Pritchard 1907; Rees 1932; Richards 1998.